The General Motors G platform (also called G-body) was an automobile platform designation used for mid-sized rear-wheel drive cars. It made its first appearance from 1969 to 1972, adapted from GM's A-body, and reappeared from 1982 to 1988. The second series of G-bodies began production designated as A-body cars in 1978, but were redesignated as G-body when the new front-wheel drive A-body platform was introduced in 1982. The G-body designation was originally used for the 1969–1972 Pontiac Grand Prix and 1970–1972 Chevrolet Monte Carlo personal luxury cars. Between 1973 and 1981, the A-body coupes with formal rooflines were designated as A-Special and after 1982 dubbed as the G-Special. These special coupes included the Monte Carlo, Grand Prix, Oldsmobile Cutlass Supreme and Buick Regal two-door models; the 1978 model year was the changeover year between the larger 1973-77 bodystyle and the reborn A/G platform. For the 1982 model year, the Chevrolet Malibu and Pontiac LeMans coupes were dropped along with the Buick and Oldsmobile fastbacks. 1983 was the last year for wagons and the Malibu sedan, leaving the G-Special coupes, Buick, Oldsmobile and Pontiac formal-roof sedans and the Chevrolet El Camino/GMC Caballero. For 1988, most remaining G-body models were moved to the new front-wheel drive GM W platform. The Pontiac Bonneville had been moved to the H-body for 1987, the El Camino was dropped without a replacement and there would be a one-year gap before the W-body Chevrolet Lumina coupe replaced the Monte Carlo. GM later used the G-body designation for unrelated full-sized cars. The G-bodies were some of the last cars to follow the classic front-engine, large V8 and rear-wheel drive muscle car formula, remaining popular while most mid-sized cars moved to front-wheel drive equipped with a modest V8 or V6 engine. They were also among the last production-based vehicles raced in NASCAR (and quite competitively at that, with the Buick Regal in particular dominating many races in its time). NASCAR regulations continued to stipulate production body parts until 2003 (namely, the hood, roof, and deck lid), but since most of the vehicles that bodies were derived from during this period had a transverse front-wheel drive layout (many even lacking a V8 as an option), the drivetrain and all running gear were either custom-built or sourced from other (usually, older) models. There is also speculation that 3 Hurst/Olds editions were made using 1988 Cutlass Supreme Classic bodies. These were not marketed through GM though. There was also a Hurst/Olds body kit available in 1988. The 1986.5 Grand Prix 2+2 had cosmetic changes which included a NASCAR-qualifying nose cone (also available through GM for installation on any 1981–1987 Grand Prix). There were 17 Grand Prix GTs offered by Myrtle Motors in New York which offered a slightly different look and had some performance tuning in 1986. 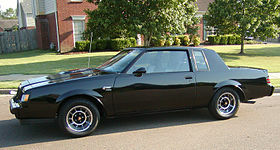 The 1987 GNX was made in conjunction with ASC/McLaren and 547 were made, which included a unique suspension system, fender flares, Stewart-Warner gauges, larger Garret turbocharger and intercooler, and a net power of 276 hp (206 kW), above the 245 hp (183 kW) of the regular Grand National. There were many more features that set the GNX apart and these are detailed in the GNX article. GBodyLED - Modernize Your Vehicle Lighting. This page was last edited on 18 April 2019, at 04:49 (UTC).